The Michigan State Spartans upset No. 7 University of Michigan, 14-10, on Saturday night in a rain-soaked game at the Big House. Michigan State (4-1, 2-0 Big Ten) has now topped the Wolverines (4-1, 1-1 Big Ten) in eight of the teams’ last 10 meetings. A downpour in the second half of the rivalry’s first night game forced sloppy play in the wet conditions, as the Wolverines scored the only points of the second half to pull within a score. Ultimately, Michigan’s ineptitude on offense sunk the nation’s No. 7 team. Quarterback John O’Korn, filling in for the injured Wilton Speight, killed three consecutive drives late in the game with interceptions. All of O’Korn’s interceptions came during the heaviest of the night’s rainfall. Coach Jim Harbaugh acknowledged after the loss that throwing in the rain may not have been the best strategy. The Wolverines failed in that endeavor, especially in the second half. In addition to the team’s five turnovers in the game, the Wolverines did not put a drive together of more than 33 yards until the final drive of the game. Even then, sophomore receiver Eddie McDoom dropped a pass that could have given the Wolverines four more chances to throw to the end zone. 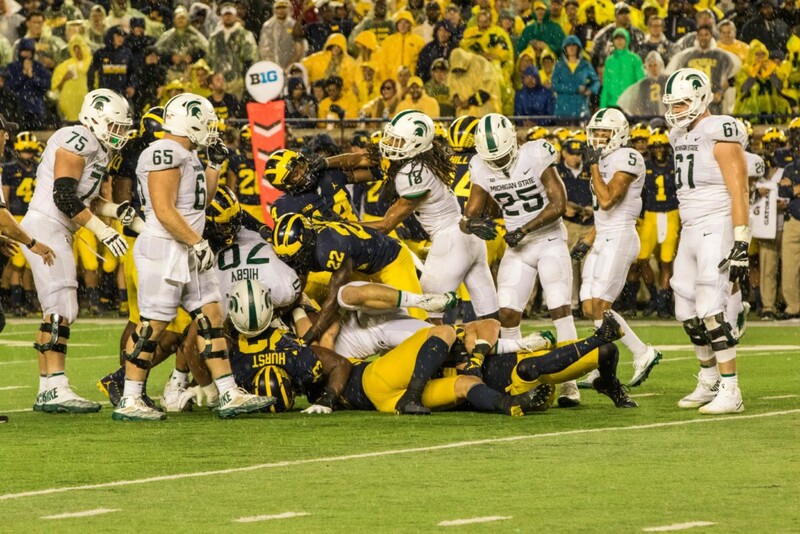 A last-chance “Hail Mary” play fell incomplete as players in maize and blue lay face down on the soaked turf, while a sea of white stormed the field to take possession of the Paul Bunyan trophy. Michigan’s defense, which held the Spartans to just 34 yards in the second half, did everything it could to bail out the offense as it had all season long. Maurice Hurst showed again why he is an NFL-caliber defensive lineman, finishing with eight tackles including 2.5 for a loss. The Wolverines had just two slips defensively. MSU quarterback Brian Lewerke squeaked through on one play in the first quarter for a touchdown, while Madre London took a screen pass for a nearly undefended touchdown in the second. “We’re an attacking defense,” said Hurst. “Whenever we get a chance to get back on the field, we’re excited to play the game” he said. After the home loss, Michigan fell to No. 17 in the national rankings. The Wolverines will head to Indiana on Saturday in hopes to rebound from the loss. O’Korn will remain the starting quarterback according to Harbaugh, as Speight was announced to be out “several weeks” after cracking three vertebrae against Purdue weeks ago.